welcome to the weblog! here you can read posts by me, or maybe other people, that were written to put on the site! it could be an interesting story or just something i felt like putting on line. you wont know until you read it... so what are you waiting for! get clicking!!!! 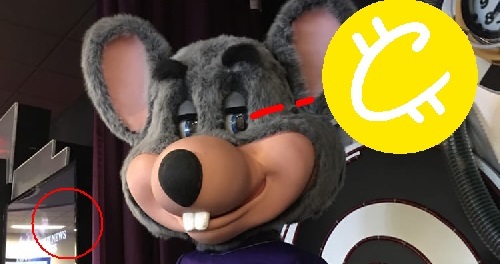 TEXAS- In a landmark move already being applauded across several niche crypto-communities, CEO Tom Leverton of Chuck E Cheese's Pizza Time Theatre has announced that the stores will be moving from their previous ticket and token based economy to an entirely blockchain-oriented system. "We saw the writing on the wall, and realized it was time to bring our business into 2018," said Tom, tearing tickets out of a wailing child's hands. "The future is now, and we invite you to experience it with Chuck, Helen Henny, Mr. Munch, and the rest of the crew here at Chuck E Cheese's." The new software being installed into the classic arcade machines available at the pizza and gaming establishments operates on a revolutionary cryptocurrency known as ChuckCoins. These ChuckCoins can be converted to and from local currencies, in addition to being won from the arcade machines themselves. Children in need are also able to receive ChuckCoin loans, with the understanding that if they are unable to pay them back, they will be sent to work in the Deep Mines, harvesting cheese and pepperoni for the world above. "This works out well for us parents too," says Maria Donovan, mother of three. "It means I don't have to worry about keeping track of all their tickets, and can finally get some me time at the most relaxing place on Earth." At press time, Maria was seen flirting unashamedly with the teenage prize exchange employee while he gave her son a small rubber ball for 300 ChuckCoins.